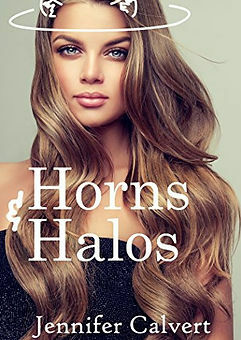 Horns & Halos poetry collection is dedicated to woman, who’ve inspired, provoked and stirred emotions and thoughts. Woman have such strength of heart and mind and I wanted to write a poetry collection to honour that. Poetry is fluid and interchanging based on emotion and perception. It allows both the poet and the reader to discover and interpret the words, for themselves. Life is a lot like poetry, ever-changing, unique, flexible, forever challenging the mind,and flooding the senses. 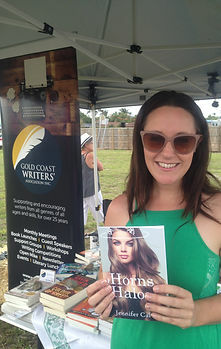 Horns & Halo’s was written to convey this sense of self through both emotion and experience and connects the written word, with the real world. 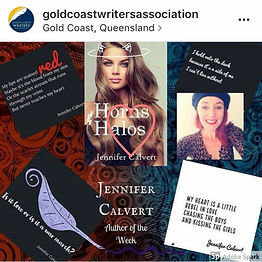 Horns & Halos is a fitting title for Jennifer Calvert’s first collection of poetry. My immediate perception is that the poetry is autobiographical. The horns are evident in the lovers who’ve wronged her and the human conditions that have left her lost and empty. They are all there; vulnerability, betrayal, despair, broken promises and the weight of responsibility. The halos are the love; love for a lover, a husband, a child, for nature, for the beauty of renewal and for the glow of desire. Jennifer creates blank verse with considerable insight and stunning imagery, often with abundant sensuality, a generous amount of cheekiness and always with a minimum of carefully chosen words. This is a wonderful, warm collection of poems to delight women in particular. Everything about this poetry collection spoke to and speared my heart. Every word is woven so beautifully and it appears almost effortless. I’m so excited to see more from this poet! 40 pages sewn by poetess, Jennifer Calvert, 128 poems that spreads across a smorgasbord of emotions. Pick a theme, Love, Broken Pieces, Warriors Hearts, Self-Love and being a Badass, you will definitely have a taste that is refined and raw. The presentation of Horns & Halos allows the reader to breathe from one poem to the next, from one verse to the next. That breath taken is the moment to savour. I highly recommend this collection of poetry to anyone who is famished for the art of words. Horns & Halos is a beautiful and powerful collection of poems. Every piece, every line, every word will reassure you that no matter your struggles, your past, you are pure strength held within the human form. A powerful collection taking the reader on a journey of self empowerment. Jennifer Calvert reminds us of what it is to feel love and sadness all in the same book. Her poetry is evocative and opens up the emotions of the reader. I would highly recommend this book to anyone looking for poetry on the full spectrum of life and love. Jennifer Calvert writes with a liberated pen. Her poems are bold and sassy. I love the way she pours her heart into her poetry, a poetry that is truly unique in style and composition. Jennifer has a powerful voice that I find inspiring and fresh. Her amazing talent for writing and portraying the depth of soul is evident in every poem. I look forward to seeing more of her poetry.